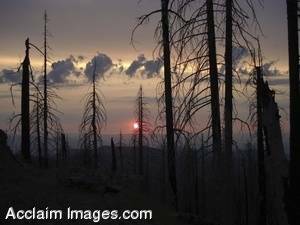 Description: Stock Photo of a Cloudy Sunset Seen Through a Forest Fire Burns Clearing. Atop Grizzly Peak in the Southern part of Oregon you can view the last of the light before the sun disappears. This photo was taken in a burned area that happened a few years earlier in southern Oregon. You may purchased this photo as an art print or poster. It is also available to license as stock photography.